1. Preheat the grill to medium-high. Toast the cumin and coriander seeds in a dry frying pan until they start to release their aroma, then crush in a pestle and mortar. Sprinkle over the lamb and season. Grill for 3-4 minutes on each side, then leave to rest for 2 minutes. 2. Meanwhile, toss the carrot with the rocket, red onion and coriander. Whisk together the olive oil, lemon juice, mustard and sugar and use to dress the salad at the last minute. 3. 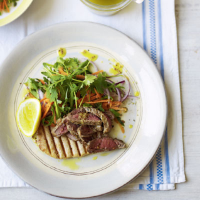 Serve the salad with the lamb and some toasted wholemeal pitta bread, if liked. This recipe was first published in June 2011.